A mysterious ocean 'blob' has been recorded by a deep-sea remote-controlled underwater camera. 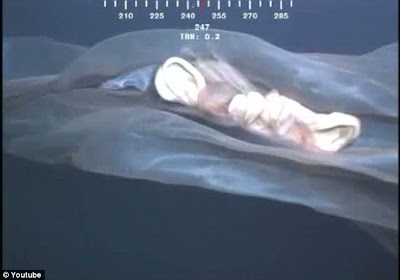 The creature looks like nothing seen before, with speculators suggesting it is everything from a jellyfish to the remains of a whale placenta. While, at a quick glance, the description of a jellyfish makes sense, the creature has organs and appendages never spotted on a jellyfish before.